After pursuing a recipe that used 6 egg yolks, I had a moral duty to rescue at least some of the egg whites I had set aside. My inner-thrift simply wouldn’t let me throw away perfectly good egg whites, but I couldn’t face making macarons. After a little searching, I stumbled upon a recipe for financiers, which requires egg whites. I’ve always like the sound of ‘financiers’…the word conjures images of fancy fellows eating dainty sweets. It seems there’s no definitive reason for the name, but it could have originated from the fact that these almond-meal based cakes were favoured by the gents working in the financial district, or by the fact that the cakes were shaped like little gold bars or as someone suggested, perhaps it’s because they’re made on almond-meal and therefore expensive and only eaten by the wealthy. 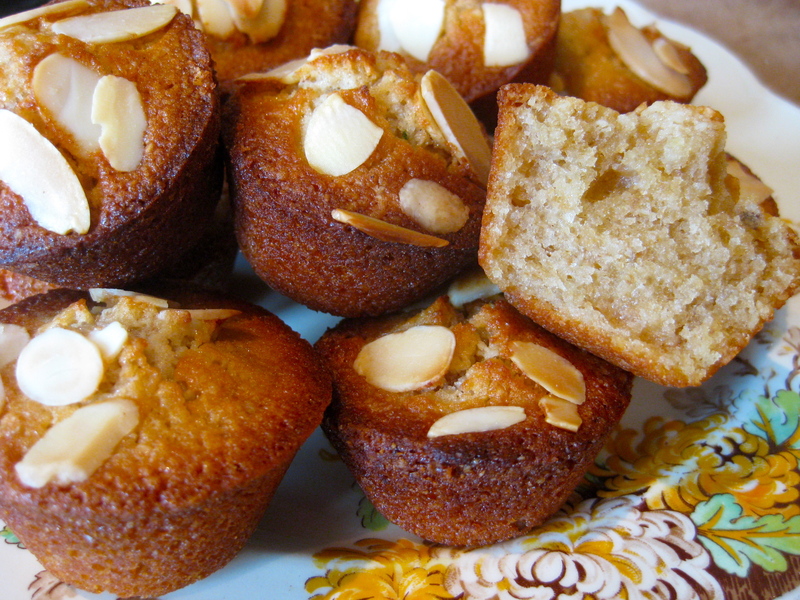 Financiers taste similar to friands, a little muffin-style cake that were a big trend in Australia a while back, but the difference is that financiers use browned butter, where as friands don’t. As usual, I didn’t have everything I needed for this last minute financier folly, so I improvised. Instead of using all almond-meal, I whizzed up some walnuts I had in the cupboard. They worked just fine. I’ve also read that coconut can also be used in a pinch. So don’t be discouraged if you don’t have 140g of almond-meal, make it up with another kind of ground nut. I suppose hazlenut-meal would also be very nice. Another hurdle I faced was that I didn’t have any traditional ‘gold bar’ shaped pans, so I used a mini-muffin tray instead, with great results. Finer points aside, it turns out financiers are a splendid way to use up left over egg whites so don’t shy away from this fancy-sounding sweetie. Just go ahead and throw yourself – and those left over egg whites – into this recipe. Brown the butter. And use a little of it to grease the mini-muffin holes. Mix the dry ingredients into a bowl and then stir in the egg whites, followed by the cooled browned butter. Spoon mixture into the holes, you should have enough mixture for a whole tray of mini-muffins. Pop in the oven and cook on this high heat for about 4-5 minutes, and then turn the oven down to 200C and bake for another few minutes or until nicely browned on top.